Mike - in the attached paper, it demonstrates an relationship between solar activity and the speed of rotation of the earth. There are three things about this micro nova theory that could cause a climate change here on earth. 1) the rate the planet's rotation could change drastically in such a vast magnetic / solar wind / CME out burst scenario - even if short lived. 2) the vast amount of cosmic radiation entering our planet's atmosphere would overwhelm the geomagnetic field, resulting in a very thick cloud cover and it's albedo effect. In the below graph you see this recurring pattern - a spike in temperature, followed by a rhythmic cooling off as the temperature drops 10 degrees Celsius (about 20 degrees Fahrenheit) before the whole cycle repeats. If there were a significanti solar nova that overheated the oceans, evaporating them on a massive scale, and followed by the dust, torrential rain and snow falls after resulting cloud / dust cover that built up the polar icepack, it could easily explain the recurring ice ages. We are at the start of a cooling off period. This cyclic co2 / temperature fluctuation is likely to be mostly unaffected by manmade emissions. The hypothesis that is being bandied about recently, is that there is a shorter, cyclic mini, albeit less potent than the above larger cycle, nova scenario. 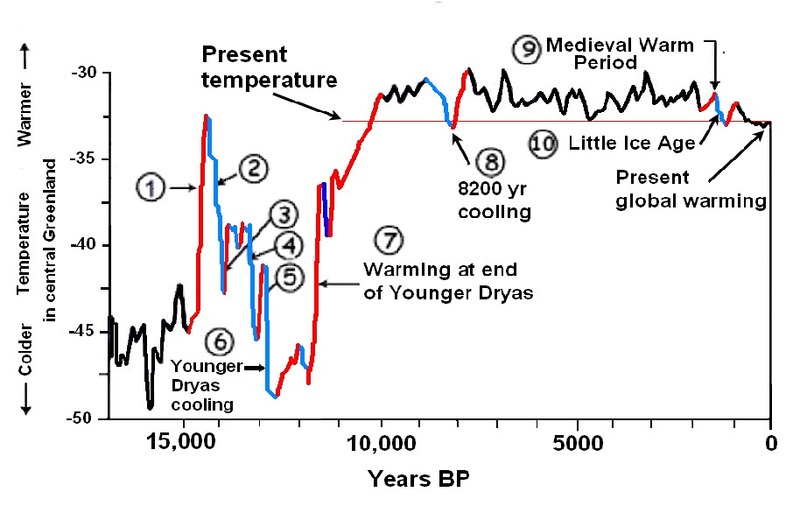 In this graph which corresponds to our current climate, there's a spike in temperature, followed by a crash. What could cause such a variation if not from the sun? Inter stellar dust clouds? Nearby supernova? There is a vast trove of data showing the relationship between solar output and weather. It seems obvious where to look. By the way - the infamous hockey stick of manmade co2 emissions is that tiny uptick at the far right of the graph - as you can plainly see, the earth was much hotter in the previous centuries than now. The Spörer, Maunder and Dalton Minima correlate reasonably well with observed periods of cold climate in the years 1440-1460, 1687-1703 and 1808-182. Therefore, a causal connection has been proposed. From the mode of changes in ocean surface circulation in the North Atlantic, two facts are established; viz. (1) that the recorded cold periods in western Europe, primarily, are driven by changes in ocean circulation (interchange of angular momentum between the solid Earth and the hydrosphere), and (2) that all the three periods of cooling represent periods when Earth’s rotation experienced a speeding-up (increased rate of rotation and decreased LOD). Sunspot activity and LOD express a good correlation when plotted against each other. This suggests (or indicates) that variations in the Solar Wind strength affect the Earth’s rate of rotation, which in its turn affects the oceanic and atmospheric circulation. The oceans being the Earth’s greatest store of heat has a vital impact on the redistribution of heat via changes in the ocean surface circulation. The Gulf Stream and the Kurishio Current, both bringing hot equatorial water to middle and high latitudes, have a central role in redistribution of heat and oceanic water masses (controlling the interchange of angular momentum). Similarly, the Humboldt Current play a central role in bringing cold low-latitude water up along the South American coast in ENSO and super-ENSO variability. In conclusion, there seems to be a strong causal chain-relation between sunspot activity, solar wind strength, Earth’s rate of rotation, oceanic surface circulation and regional climatic changes on a decadal time-scale. I notice that the temperature range on the 2nd graph is -25 to -60. What temp measurement is that exactly? Seems a tad chilly. The heading says ice core temp. They aren't just measuring the temp of the ice itself in the core are they? There are two major schools of thought – there is gradualism, where changes in Earth take place over may years, centuries, thousand and millions of years, such as glaciers slowly advancing and receding, the northward movement of the pacific crust against the north American crust, up thrusting of mountain ranges. There is catastrophism where there are sudden dramatic cataclysms – meteor impacts such as the Chicxulub impact that wiped out 90% of life on earth is a really good example. Another is a combination of the two: there are gradual changes punctuated by catastrophes. One of the more interesting hypothesis is the pole shift theory. This has been around for quite a while, popularized by Charles Hapgood a few decades ago. In a nut shell, the earth’s crust slips from its current position to another. The last was some 23 degrees. Prior to the slippage part of Antarctic was ice free because it was further north, and Siberia was further to the south. A very accurate ice free Antarctica can be seen in the Piri Reis map, drawn in the 1500s, which was compiled from earlier maps. Hapgood and other’s theories was that the crust was displaced – the North pole was no longer in Hudson’s Bay in Canada but was relocated to the Artic Ocean. While there is plenty of scientific evidence that this happened, the causal agent is not understood. Hapgood’s hypothesis was that as ice age glaciers built up in the north polar region, immense water weight built up, centrifugal force pulled it southwards – it being the ice pinned to the crust – resulting in the crust slipping over the liquid magma. How else was one to explain Mammoths with frozen tropical plants in their mouths? Unfortunately, they have to be quick frozen for that to have happened. Big mystery. Hubbard opted for a pissed off OT ripping the air cover off the planet, and giving it a twist, as he discussed in the Free Being tape. It was something I always questioned. Hapgood’s centrifugal forces acting on glaciers hypothesis has holes in it so leaves one to wonder. Our dear CIA has censured a book on the subject which was recently released as explained in the first of the two below videos. In it we find a different scenario where the pole shift is intertwined with the magnetic pole shift – as the magnetic pole shifts, the crust is pulled along with the shift in magnetic orientation. It is a rather sudden shift and giant tsunamis occur – hundreds of feet tall as the inertia of the water holds it in place as the crust shifts beneath the oceans. It drives earth civilizations into the stone age. The Rocky Mountains serve as a natural barrier to such a tsunami – so much so, that the US government built the Cheyenne Mountain complex on the eastern side of the Rockies, one presumes, in accordance with the data in the newly released book. The second video goes into a different theory – that of a massive solar eruption, many orders of magnitude greater than the Carrington event. Were the Carrington event to happen today – much of our electronic based society would cease to function. It would be a disaster of biblical proportions. Neither of these videos take into account the recently discovered crater in Greenland or the one that his the ice sheet covering the great lakes at the end of the Younger Dryas, resulting the die off of North American mega fauna, though Schoch does discuss it in his recent book. Interestingly enough, Hubbard is spectacularly lacking in any evidence of such global disasters in his writing. While he launches into fanciful space opera and the like, about the only mega disaster he entertains is incident 2 of the OT III materials – the wall of fire found in the H bombing of volcanic craters. I find there is an interesting relation between his description of the wall of fire and the solar outburst / mini nova discussed in the second video. Maybe he was on to something but his space opera paradigm got in the way? We all died on the 21st of December 2012. Good question. The temperature on the upper graph makes more sense. But thanks to my finely honed cut and paste skills - I have your answer. So, could our sun have much larger CMEs / flares than the ones we have seen so far? Well, a bunch of research has been done observing other normal stars, similar to ours, and the answer is yes. So, this theory of a micro nova is not so far fetched if it occurs on other similar stars. The characteristics of flashes from 24 normal stars are presented and discussed. Rate estimates are made for the flashes and possible mechanisms for them are considered. The consequences for the earth of solar flashes of varying intensities are examined. Stars that are just like our Sun have flares more than a million times more energetic than the biggest flare ever seen on the Sun. The Kepler satellite has allowed these superflares to be studied in detail for the first time. Solar flares are caused by the sudden release of magnetic energy stored near sunspots. They release 1029 to 1032 ergs of energy on a timescale of hours1. Similar flares have been observed on many stars, with larger ‘superflares’ seen on a variety of stars2,3, some of which are rapidly rotating4,5 and some of which are of ordinary solar type3,6. The small number of superflares observed on solar-type stars has hitherto precluded a detailed study of them. Here we report observations of 365 superflares, including some from slowly rotating solar-type stars, from about 83,000 stars observed over 120 days. Hello, just good evening, for my first post on this board. I thought it was on November 8, 2016. Make a posting in the New Member Introductions section to introduce yourself. Hmmm...12/21/12. Interesting combination because Ocasio-Cortez said the Earth will end in "like...12 years". Could this just be coincidence? I think her 12 year do or die date is for the birds, on the same magnitude of veracity as Al Gore's dire warnings, though Bill Maher sees it in a different light - that it's said to spur people into action. If you look at the maps of the ocean bottom - you see that the oceans were hundreds of feet lower. Her catastrophe is ant hill sized compared to the paroxysms that were in the past. 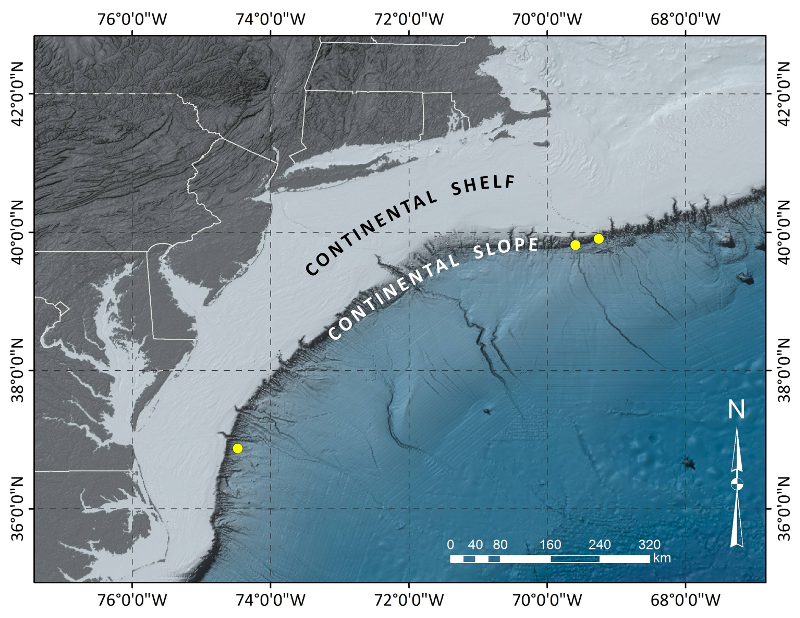 Take a look at this image - see the rivers going down from the continental shelf? They must have formed when there was no water there. Fresh water is lighter than sea water, so they weren't formed by underwater fresh water flows and there since are no downward currents there, save the perpendicular north - south gulf stream types. How else could they have formed? 02/02/2020 which reads the same both ways. Just thought I'd pass on that essential piece of information to y'all. Mention birds and you're bound to get a response from me, I'm obsessed with 'em. They're more than conscious, they're highly intelligent (ask Sheila). An interesting detail - if I've got six small pieces of cheese in my hand, my friendly crow will unerringly go for the largest piece first and leave the smallest until last even if the difference is measured in millimeters, and this is the case with whatever food I give him. The instinct to capitalise is simply awesome and there's no time to waste, he'll grab the biggest bit first every time. His judgement is astonishing. "I had rather hear my dog barking at a crow, than a man swear he loves me." I've always found that very funny. And I do so like Crows. When we got her I placed her under a light bulb for warmth inside a 10 gallon aquarium which I then placed above the TV so she'd see us as watching over her even though we'd be watching our shows. She got too socialized which was why I ultimately sold her to a breeder who placed her in a massive aviary & cage with a male Orange Wing. She's had a better life than cooped up in a small cage where she put up a fierce raucous when left alone. She ALWAYS insisted on human interaction and was a wonderful bird, just too much of a handful! She couldn't learn words too well but as long as I'd sing "la, la, la, de laddy lady la..." she could learn the melodies and looked like a little orchestra conductor with her well timed wing flapping. I had an endless loop bird training tape with the melodies that I worked on with her, the tape helped make her feel like she had our attention when we weren't home as I had it on a timer. I'm sorry, but any idea of a bird being kept in a cage gets me frothing at the mouth with rage. Yeah, cages are merely for coping with a bird that would only find trouble if left out. She would find string to get herself entangled in, usually she'd get it all twisted around her feet and would have to be rescued when she'd get tangled up when hanging upside down from it. She was too acrobatic for her own good. The aviary cages were like 12' high by some 8 feet across so she could actually fly around, like small silo's. They're social animals so need a flock. They don't do well alone and don't learn well that way, either. A partial clipping and baby-proofing a house for a bird works. That way they can still fly, but mostly stay to certain areas and realize they're not in charge. Parrots can get real ornery and headstrong if they think they're in charge, same as dogs. They're just as happy submissive, it's their nature. A huge, walk-in outdoor aviary is ideal, but then you have to have the right weather or temperature control.